12am HOH room – Shelli, Clay and Vanessa are talking. Shelli says here’s another reason why I know we can trust Becky, her happiness has changed immensely since our conversation with her. And you can’t hide that, same with Steve’s. Vanessa says I know. Yup All can say is ideally two people from our side win. Most ideally someone on our side that is not the 3 of us retains power and can take out someone Important for us. Clay says Austin will have no shame throwing it. Vanessa tells Shelli that Austin can’t wait to throw it to do some sh*t for TV for the theatrics of it. I think it would be hysterical. Clay says Me, Johnny Mac or Steve are the top 3 I want to win. Vanessa says twins are fine too! Shelli says then all three of us are available to win during the double eviction. Shelli tells Clay we can’t use three’s company as our name because its trademarked. Clay asks what about Third Wheeling. Shelli says no because Clay is the one third wheeling it so far. Vanessa says you better get out there an win you an HOH! Shelli says its okay honey I’m just trying to get you fired up for tomorrow! Clay says of course the others are going to turn their backs on us but no one wants to be the first to do it. If the double eviction goes smoothly, no one is going to want to make the first move. Shelli says I fear they will put 2 of us up and if any of us wins pov, one comes down and another is going up. These three (Clay, Shelli, Vanessa) are the ones they’re going to target or Austin & the twins. Vanessa says that Austin & the twins would be easier targets because they wouldn’t face as much social repercussions. They’ve seen me and you (Shelli) get pissed and they we would if the other one of us leaves. Shelli says Johnny & Becky need to remain relevant as targets as well. They head down stairs to join the others. 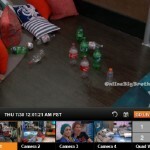 12am – 12:45am The BB bowling continues. At the end of the game Meg adds up the scores. Liz and Steve got 84. Johnny Mac & James got 108. Jason & Meg got 83. Meg says Johnny Mac and James killed all of us! 1am Living room – Austin, Liz, Steve, Jason, James, Meg, Clay and Shelli are sitting around the living room chatting about random things. Meanwhile up in the HOH room – Becky listens to Vanessa’s music while Vanessa picks out her outfit for tomorrow’s live episode. Becky then practices her eviction speech tomorrow “First off I would like to thank everyone back in Colorado, friends, family. House guests this is an intense game and we have a lot of amazing players this season. But even behind all that we have a lot of genuine people and I would love to keep playing this game with you guys and remain here this summer. Jason being next to you on the block is incredibly hard. We’re so different, you’re wild and I’m basic but we’ve come so close and its hard sitting next to you. I have no bad words to say about you other than your cooking… its ratchet! On that note! Please keep me here!” Vanessa tells Becky its great. Vanessa tells Becky don’t pack everything, you’re not going anywhere! Becky asks do you want to make the four of us an alliance? (Becky, Shelli, Clay, Vanessa) Vanessa says she wants to if everyone is ready for it. Becky says we’ll need a name. We should be “The Generals”. We will still need to run it by Clay. Vanessa says people will never suspect it. You’re seen as being on the other side of the house. Vanessa asks does Jackie have any idea. Becky says no idea. 1:10am – 1:30am Jackie pulls Austin into the cabana room to talk. She tells him that she wanted to apologize for this week. I’m sorry if you felt like the house was against you. Austin says the whole thing started with Jason and the only person I was upset with was him. He used information that I didn’t even mean to be harmful. It was a non game moment. I felt like I could trust him and he took what I said and used it against me. If things didn’t work out a certain way I would be home right now. I feel like I just got a second chance here this week. On Saturday I was 90% going home and then by Monday by the grace of god I got off. I’m just really happy to still be here. Jackie says I’m really glad it worked out with you and her (Vanessa). Jackie says I was in a weird position and I didn’t want you to think I had something to do with it. Austin says I feel like you got caught up in a moving train. Jackie says I don’t have any issues with you. Austin agrees he doesn’t with her either. Austin says I’m not going to target you if I win HOH. You have nothing to worry about with me. Austin says I had to promise to the house that if I am in the end don’t vote for me. I’m just here for the experience at this point. Maybe things will change, I don’t know. But I had to do that to stay in the game. Jackie says we’ll see how things go, its still basically 2 months from now. Austin says I had to basically broker my soul to stay in the game. If you’re not coming after me, then I’m not coming after you. Austin says you weren’t even in charge any ways so I can’t hold you accountable. Austin says that he promised his vote to Becky. Jackie says that she did too. 1:30am – 1:55am Austin heads up to the HOH room and tells Vanessa, Liz and Steve that Jackie just apologized to him and said that she promised Becky her vote. She said that she got caught up in something that she didn’t want to be a part of and felt terrible. Liz asks caught up in what? Austin says in trying to get my out. She said she’s excited for the twins to come in. She said that she isnt going to put me up. Liz asks well who is she going to put up if she isn’t going to put up me or you. Austin says I don’t know, I think she is still going to put us up. She’s just saying that. She said that she wanted to backdoor Steve. Vanessa asks Steve do you know what you’re going to do tomorrow. Steve says win HOH. I’m the only one here than hasn’t won. Austin says I’m putting her up in a heartbeat! She was .. it was so pathetic! She’s nervous as f**k! Austin tells Vanessa that Jackie is a dragon! I’m putting her up! Vanessa tells Austin to win HOH. Austin says If I don’t Steve will! Vanessa says Jackie is so two faced! Vanessa says the other side of the house doesn’t realize we’re working together. They think its 3 and 3. Vanessa tells Austin she can’t wait to see the kiss. (Liz promised Austin if he wins HOH she will kiss him.) They head out of the HOH room to play chess. 1:55am – 2:25am Meg heads into the HOH room. Vanessa tells Meg I want you to know how brutally difficult this move was for me to make. I cried when I had to put up Jason. I want you to know that it was never an intention to target you. Meg says I know and you’re one of the people in the house that I .. I know we don’t have a constant connection but I feel like you’re one of the people in the house that I can trust. I know that Clay and Shelli have a relationship with you and I’m close with them. I hope you know that you’re not a target for me. Vanessa says you’re very far down on people’s list of targets. Meg says you’ve come off with the least blood on your hands from this. Vanessa says you shouldn’t be nervous coming out of this week. Vanessa says that she knows Jason was worried about not having a job when he gets out but I am going to hook him up if he doesn’t get something from this. Even if its being my DJ booking agent. Meg says the 3 of us (Meg, James, Jackie) not knowing has put us in our own little target group. Vanessa tells Meg she has nothing to worry about. What you’re doing is working. The perception is that you’re not a big target. Meg’s annoyed she hasn’t won an HOH yet. Vanessa tells Meg she’s going to win one. they end their conversation. 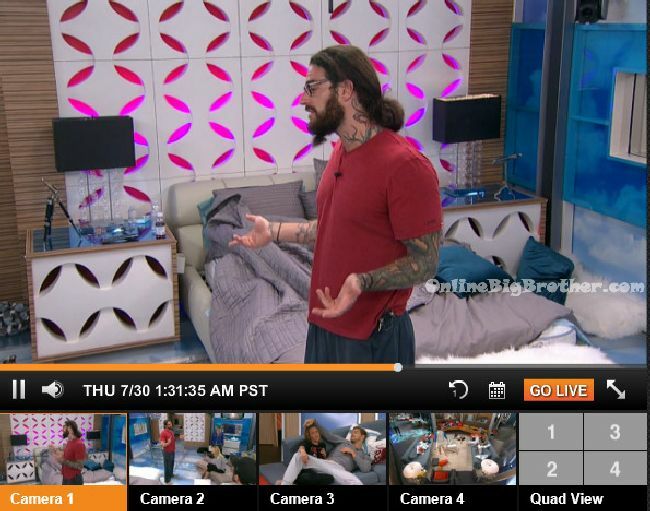 1:55am Meanwhile – Jason talks to Shelli and Clay in the havenot room. Jason tells them that Jackie said she would give me her vote if I have your votes. Jason says that Jackie told him if she wins HOH she is going to put up Austin and Steve. With that side of the house voting out Steve. She said if she doesn’t win that HOH and if she wins the double eviction HOH she wanted to go after you and Clay. Shelli asks did she really say that? Jason says I swear! I swear on everything! Shelli asks when did she say that? Jason says last night when we were up really late. That’s all I’ve got. If Clay didn’t win the veto this week.. the only votes for him to stay would have been me, Meg and you. He would have gone home. Shelli asks who? Jason says Johnny Mac… Everyone is just pushing the blame on you guys for me going up. It’s making you a bigger target. Everyone was saying that you’re already a target why not make you a bigger one. 2am – 3:10am Clay joins them. Jason says when it really comes down to it I can be more loyal to you than Becky. Shelli says I need specific names and conversations to back up (you saying people wanted Clay out if he remained on the block.) Jason says I went to Johnny Mac and he said its out of my hands and you know who (Jason points at Shelli & Clay) has been running stuff. I didn’t talk to Austin or Liz. Even Vanessa said that I would cut James and the only people I said that to was you two. Shelli says that is the lamest excuse. Jason says James is not playing a good game, why should I be loyal to him when he isn’t loyal to me. Same with Jackie. Shelli says you say everyone but it sounds like only Johnny Mac. Jason says well and the Vanessa thing. Steve just ran from me. You know how everyone just dances around it. Jason says they’re looking at you (Shelli to be voted out) not him (Clay). Shelli asks whos they? Jason says Becky. Shelli asks whos they? Jason says well its not so much they. Jason says you guys are my babies and Meg and I would be so down for a final 4. Shelli says when you say they are you talking about Becky & Jackie? Jason says we’ve been talking a lot more late at night and it was only until recently the Jackie started to think it was better to get out Becky. Clay says you say you trust us, you should have come to us 3 days ago. Jason says I didn’t want to over due it or for it to be all over the house. I have no idea how to socially do this game. Meg has been running that. Jason says you will have me because I have no other option. I will be loyal to you till the end. Shelli asks why do you think Johnny Mac was talking about us and not Austin & Liz? Jason says I was reading between the lines and some times you read the wrong lines. He very well could have been talking about them. Jason leaves. Clay says he talked way too long. He was just throwing out everything to see if something would stick. Shelli says its too late to flip on the plan. Clay says he said to much. He back tracked a lot and re-snaked a lot. They discuss Jasons points and how none of them made sense. Shelli thinks Becky came in here wanting to get with Clay. You need to keep building a rapport with her. Nothing Jason told us was new information. Shelli says tomorrow we need to go to Becky and tell her that Jason said she was coming after us. We get her to promise she isn’t coming after us. Clay says she needs to stop saying power couple because it makes it seem she’s talking about us.